This week I'm sharing an older article from my travel-blogging days because it's so on message with last week's post about being stuck in your comfort zone. I not only suggest a way to push yourself outside of said comfort zone (within a controlled setting), but argue that sometimes we have a moral imperative to do so. Enjoy! I know of a man who traveled through an impoverished country in order to push past his sheltered upbringing. He was so shocked by its hardened reality that he isolated himself for months afterwards. Eventually he returned to society, but it was obvious that he was a changed man. Chances are you’ve heard of him, too, likely under his stage name, Buddha. And that trying place he visited? Right, that was India . . . . While I’m not suggesting that a trip to India will compel your isolation under the Bodhi tree, it is an eye-opening experience, and even a life-changing experience. For those of you toying with a trip to the great subcontinent, and especially for those thinking about a short trip to the “Golden Triangle” – the monument-packed region of Delhi, Agra and Jaipur – here is some straight talk about what you need to know before you leave. Even crossing the street is difficult in India. Note, this is a street, NOT a parking lot! First and foremost, India is about beauty and reflection. It’s a snap to picture one of its serene interiors, where floating candles and lotus flowers embellish a fountain of water. We’re all familiar with the very unique aesthetic developed originally for emperors which keeps both the body and mind cool and relaxed. You’ll see many places exactly like the one described . . . at spas and yoga studios around the world. Also in Bollywood movies, Incredible !ndia campaign shots and even in luxury resorts within India (enjoy a cocktail at Jaipur’s Rambagh Palace, one of the Taj group’s chain of luxury hotels, for a taste of how the majarajas must have lived). But that’s about it. So let me offer a quick rewrite. First and foremost, India is about extremes. And nowhere is India more extreme than in its mega-cities (Delhi alone is home to more than 16 million people, well over twice the population of London). 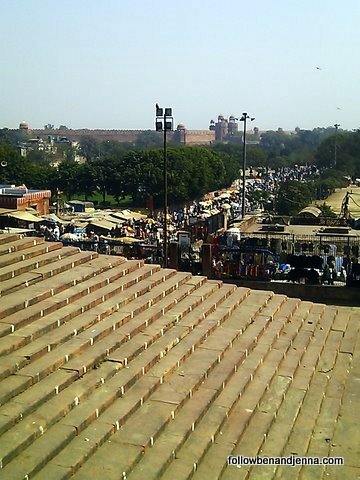 Whereas large cities in other countries are a traveler’s base camp, a place to take advantage of the familiarity brought by globalization before heading into more remote and less worldly areas, Indian cities are overcrowded jumbles where the difficulties of the surrounding areas seem exacerbated: traffic, chaos, noise, heat, filth, poverty and apathy. Unfortunately, these often dehumanizing environments are precisely where to look for some of the world’s most important monuments. The first time I went to India I concentrated on its kinder, gentler faces, but even brief transit through cities convinced me to seek out the structure and security of a tour if I decided to return to see the Taj Mahal and other top tourist attractions. So when I stumbled upon this site’s contest to sponsor a blogger’s journey to the Golden Triangle on a G Adventures tour, I didn’t have to think twice. Before I knew it, a date was chosen and my Flight Centre consultant was patiently emailing me every possible flight itinerary (departing from Frankfurt rather than London invalidated some of the great deals offered by the UK-based agency, which matches all published fares out of the UK). In the end AirIndia offered the best option, and I was set. Over the next couple of weeks I’ll tell you all about the trip and try to clue you in to the bits I wish I had known before I left. It wasn’t always pretty, but it was exciting, and not the kind of experience I’d ever trade. As long as your expectations are realistic, and you’re willing to exercise your patience muscles, and let go of that much-beloved thing called control, and especially if you’re in the hands of trusted guides who help ease the uncertainty . . . well! You’ll be channeling Buddah in no time. Many people say that India’s not for everyone. I think the opposite. We all share this small planet, and therefore those of us with means, whose decisions affect the most people, should spend at least some time on each of the continents. India – which is predicted to surpass China’s population within decades, which is one of the world’s most rapidly developing economies, and whose philosophy and customs have molded thought and cultures around the world – most definitely is for everyone.